Indicates the approximate time of operation remaining in years. 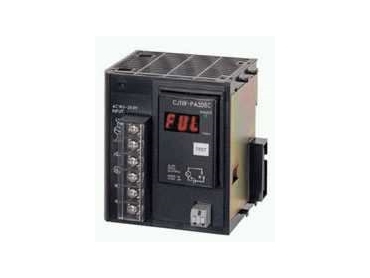 OMRON Electronics has released PLC power supplies that can predict possible failures. The maintenance forecasting power supply units have a seven-segment digital display that shows the approximate life expectancy of the power supply. The concept was adopted from Omron's S8VS series of standalone power supplies. They are used in industries such as car manufacturing, where the cost of failure can be significant. Although PLC systems are generally very reliable the power supply has long been regarded as the single biggest point of failure. Most power supply failures can be attributed to electrolytic capacitors, whose electrolyte penetrates its rubber seal and evaporates over time, reducing performance. The speed of evaporation is proportional to the ambient temperature. According to Arrhenius' law, the evaporation rate doubles for every 10°C increase in temperature. These new power supplies emulate this evaporation process and indicate the approximate time of operation remaining in years. The lowest level causes the display to flash and an output alarm to activate. At this point it is recommended that the power supply be replaced within six months. The C200H-PA204C supports the CS1 and the entire C200H series, while the CJ1W-PA205C supports the complete CJ1 series. Both units accept 100V-240V ac and deliver almost the same current are the non-forecasting equivalents. A test button can be used for testing purposes and an alarm output is available for external monitoring. CJ1 PLC systems have also been enhanced with the release of the CJ1W-PD022. This conventional power supply is only is 27mm wide and is ideal for cost-sensitive applications, which can use a lower capacity unit.